If you love BBQ then you need to know that no one does it quite like The Hitching Post! This old west restaurant is hidden in the hills of Casmailia and appears to have been lost in time. The family business has been in owned and operated by the Ostini's since 1952. They have a long tradition of slow cooking choice beef over red oak wood in a Santa Maria style BBQ. These are the guys who pioneered Top Sirloin cooking and have perfected bringing beef to a gourmet flavor and tenderness making their restaurant one of the finest steak houses in the country! Now you don't have to go out in the middle of California to experience their BBQ; their catering division will bring it straight to your wedding. Enjoy their interview and stop by their restaurant if you want an old west culinary adventure. The Hitching Post has been catering for over 25 years. Originally, we did caterings on an as-requested basis. We catered parties, weddings, and corporate events for friends and family. Amanda began catering for a company based out of Arroyo Grande at the age of 15. She gained emplyoment at the Hithcing Post in 2006, and started helping out with events immediately. Dawn has worked for the Hitchinig Post since 2006 as well, although she is the owners neice and her mother manages the restaurant, so she had been involved with caterings for a few years prior to that. One day, Amanda and Terri (Dawn's mother and the manager of the Hitching Post) were exectuing a catering at Tres Hermanas Winery, and Terri became ill with heatstroke. Amanda sent Terri home and finished out the event. After that day, Amanda met with Terri and offered to do the on-site portion of the catering business. Terri was getting older and her health wasnt what it once was, and caterings are an incredibly physically demanding day. Terri continued to handle the administative side of the business while Amanda began staffing and exectuing the events. In 2011, Terri approached Dawn about taking over the administative side of the business, and Dawn agreed. Once Dawn and Amanda took over all aspects of the catering side of the business, they began to work hard to grow the business. The Hitching Post has been a successful restaurant for over 60 years, but only in the last 3 years has the catering department become a prosperous part of the business. As a sidenote, Dawn and Amanda met in 2006, and had become fast friends. By the time 2011 rolled around, they were more like sisters. They work together extremely well, and believe there is nothing they cannot accomplish together. Who or what continues to inspire you? Both Dawn and Amanda were raised by wonderful Italian women, and part of what inspires us is the love and warmth we associate with food. There is nothing that makes us happier than feeding people, and seeing the joy on their faces as they sense our love through our food. We are happiest when the people around us are well loved, well cared for, and most importantly, well fed. We are constantly inspired by our brides, who amaze us with fresh ideas and place their own personal stamp on their event. 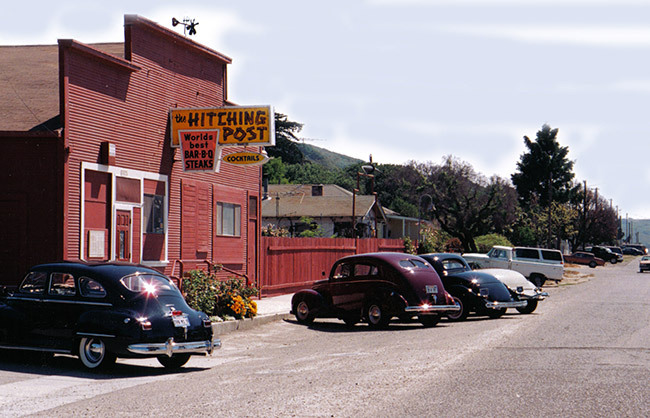 The Hitching Post is unique in that we have been a sucesssful business for over 60 years. The restaurant has been passed from father to son, and each chef has been trained at the hand of the owner. The current owner, Bill Ostini still cooks in the restaurant and personally handles all the ordering and checking of produce, meat, and alcohol. All of our sauces and seasonings are homemade. The restaurant and the catering business share chefs. Combined, these wonderful men have over 90 years of experience. The Hitchiing post utilizes a true Santa Maria style of cooking. All of our food is cooked over red oak, on a crank-style, moveable barbeque pit. The quality of our food is something we take great pride in. We get local procduce delivered daily, and strive to present only the highest quality available for our customers. We have been ordering our meat from the same trusted suppliler for over 40 years. If something does not meet our rigorous standards, it is sent back immediately. All of our meat is trimmed and cut by our chefs, and approved by the owners watchful eye. We are unique in that we bring our kitchen with us to each event. We bring our "pit" onsite, cook the food fresh, and serve it immediately. We adapt easily to our surroundings, and cook all of our food fresh, onsite. Additionally, Dawn and Amanda were taught early that we never say no to a customer. We tailor our events to our clients needs. Whether your event is 25 people for a sit down, coursed meal, or a buffet for 400, we have you covered. We go to great extremes to take care of our clients, from complining and placing rental orders, to setting up tastings, to helping select vendors, create timelines, and cordinating details, we are 100% there for our clients. Dawns corrspondence excellence in serivvce nonna not just typical backyeard bbq bring level of professionalism and a flavor profile that is unbeatable. Our ideal couple loves each other and food! They are creative, fun, and unique. Our ideal couple believes food is a way to show love and wants to treat their guests to an experience through food. We love brides and grooms who do something unique and differnet at their wedding. We love organized and passionate couples, although organization is not a must, as we excell in that department. Fun-loving couples are a favorite of ours, especailly since we will meet with them several times and correspond with them quite a bit previous to the wedding. We tend to fall in love with our couples. There is nothing more beautiful than the freindships we have made with several of our clients. Our philosophy is simple; be the best at what we do. From the restaurant point of view, we've always strived to be the best. Whether it be our food or our servce, we strive for excellence. Our caterings are no different. We have great pride in building not only a professional reltaionship, but a friendly one as well. We hire the best staff that we can, provide the best products available, and we have the best chefs on the Central Coast, both behind the barbeque pit and in the kitchen. What's your favorite part of the wedding? 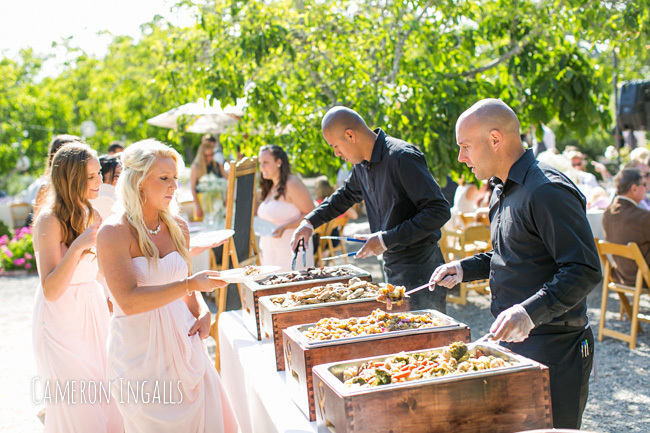 Our favorite part of the wedding is hand delivering the meal to the bride and groom. We love the moment where it is just the two of them, surrounded by the love and warmth of their guests. 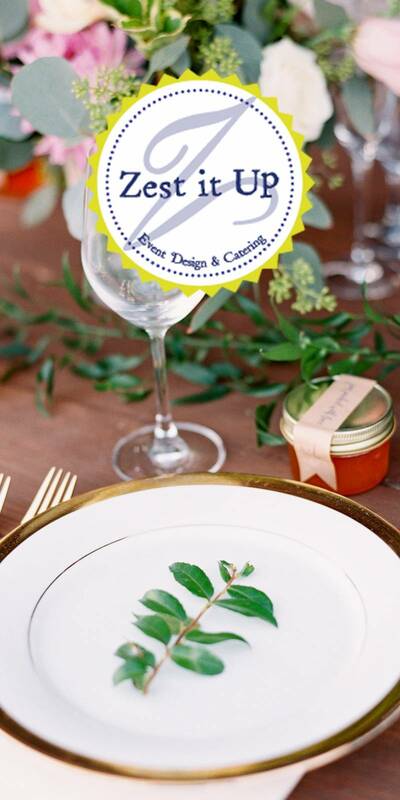 We love knowing that they and their guests are being treated to a homecooked meal, selected specifically by the bride and groom. We love the smile on their faces as we check on them and make sure they are enjoying their meal, and have everything they could possibly need. Those quiet moments between the two of them are nourishment for their souls, while the food is a treat for their bodies. Second to that, our favorite part of the wedding comes as the event closes, and we know we have worked as hard as we can to ensure the success of their event. There is nothing that makes us happier than the smiles on our bride and grooms faces as realize their event has been a complete and total success. We love people. It's a priviledge to be choosen to be a part of such an important time in someones life. Our passion stems from years of serving people the best quality food and making them feel like family. Pulling together many little details and turning them into something great it simply addicting. For Amanda, she's often called Mandy, Manda, and occationally, Amber. Dawn has had many, varying from Jones to Boss. Tell us one thing few people know. Amanda goes grocery shopping in the middle of the night! Dawn listens to country music! Wedding trend that you're loving right now. We love that people are stepping out of the box when it comes to the cake. While traditional is always nice, something new is always welcomed and exciting! What wedding trend that will be gone next year? The bouquet toss. It seems to be a trend that brings down the moral of a wedding. Thinking anything and everything was possible. What's in the top 5 of your bucket list? Where do you see your business in the near future? Hopefully, busier than ever. Expanding to new venues and getting to network with new people is always the goal.